I went out this evening to check for eggs in the front coop. And got quite a scare. Here I was thinking the only danger facing me was our surly one – eyed rooster, Roobert. And yes, he pecked at me quite a bit. But still I sauntered quite casually into the coop and was greeted by a horrifying site. Something no poultry farmer wants to see, but inevitably will some day. Thankfully Paul was home to help, because I froze up. 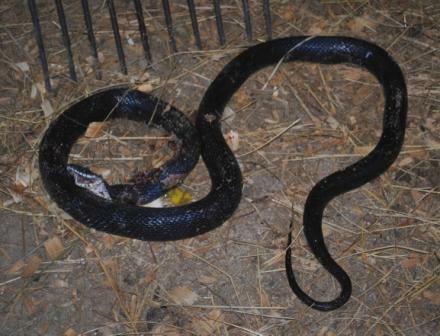 I hated killing the thing, because Black Snakes are not poisonous and are good rodent control, but there was no way to get him out of there without endangering my flock, and now that he knew where the egg buffet was, he’d be sure to return. In fact, you can see the egg yolks that oozed out of him when Paul got him with the pitchfork. No eggs for us today. The other scary bit is that this guy was only 3 or 4 feet long, and presented quite a challenge to kill. Anything larger (or venomous) would be a much riskier proposition. I might be going to the coops with a shotgun for awhile.